You can also visit some interesting markets in Milan, where you can buy everything for bargains. Those markets are all time crowded but they are worth to see and to go shopping. Going to markets is the best way to meet people and know another side of the italian life. We recommend you to pay cash. 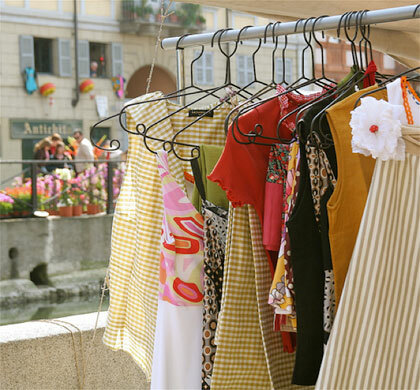 Mercatone del Naviglio Grande: It takes place each last Sunday of the month starting in September and it is situated along the Alzaia Naviglio Grande. This is an antiques market selling furniture, objects for the home, old books, jewelry etc. The market has 400 exhibitors, some of them have their own stores at the Naviglio Grande. Fiera di Sinigaglia: The Fiera di Sinigaglia in Milan is now an institution: every Saturday morning in Viale d'Annunzio along the wharf there is a flea market. You can find everything there: Indian, South American and African craftwork, new and second-hand clothes, old furniture, perfumes, candles, books, comics, records, videos and DVDs. Viale Papiniano: It is situated in Viale Papiniano, there are stands with brands as stocks and outlets. It is very popular and it offers food, plants, clothing, shoes and textiles too. Viale Fauché: Very appreciated by the fashionistas. You can find discounted clothes and shoes of the most prestigious italian stylists. This famous event takes place every year from 7 to 10 of December in Milan. It is an open air market hosted in piazza Castello, around the Sforza Castle. This celebration has very ancient origins, it started in late 1288 and was dedicated to St. Ambrose, the patron of the city. It is said that this name comes from the exclamations of joy of the children of Milan - “Oh belli! Oh belli!” that is to say "Oh beautiful! Oh beautiful!" - when in 1510 they were looking at the gifts that Pope Pio IV made bring to them by Giannetto Castiglioni. The stalls of "Obej Obej" are full of Christmas objects and decorations, but they also collect toys, sculptures in wood, antiques, craft creations in wood, iron or cloth, vintage comics, jewelry and delicacies of this period such as anice brigidini - typical sweet waffle - strands of roasted chestnuts, delicious krapfen rolled in sugar, roasted cobs and all the types of nougat. Everything done to delight children...but also adults. The tradition wants that people buy here their Christmas decorations, while eating chestnuts sold in stalls and defending from the bitter cold with a glass of sweet hot wine - called vin brulè. Stalls are prepared during the evening of 6 December and they are open to visitors everyday from 8,30 a.m. to 9,00 p.m.
Sunday flea market:(morning) in the car park of the San Donato metro station, (MM3 San Donato)./ "Mercatone Naviglio Grande" : Strada Alzaia Naviglio Grande (Metro Porta Genova). Open only the last sunday of every month.